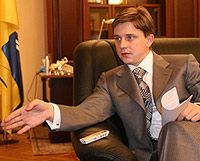 Secretary of Kyiv Council Oles Dovgyi is ready to rent the premises for work of the BYUT fraction in Kyiv Council for his own money. On Thursday, he commented in such a way the demand of the fraction that it will not work in Kyiv Council until it will have not its own premises. “The commission is created now in Kyiv Rada, which has to find the premises. If it is not able to find the premises I am ready to find it by myself”, said Dovgyi. “I can find it for my own money”, he added. For the question, for what money he intends to do it, Dovgyi said that all his incomes are pointed in the income declaration. He also promised to pass this declaration to “Ukrainska Pravda”. “And you will see that before I became the deputy of Kyiv Council I had an opportunity to do it, coming from the declaration, from which all taxes are paid”. He also said that his salary as a secretary of Kyiv Council makes up 10 thousand hryvnias.